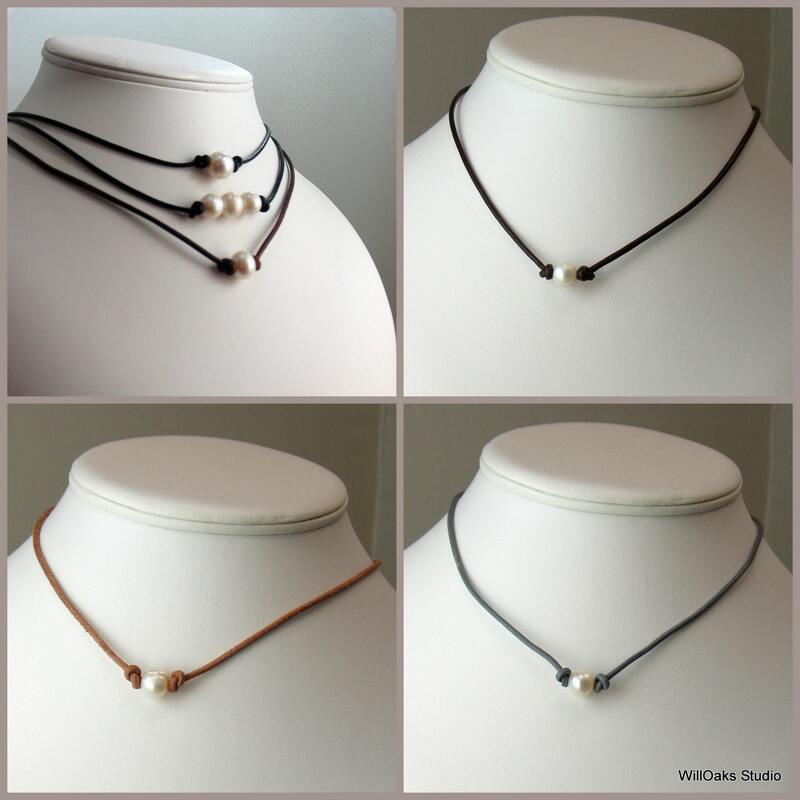 A choker necklace of pearls and leather cord made in your choice of 9 different leather colors and of one or 3 pearls. Closes at 17" with a silver plated brass lobster clasp. 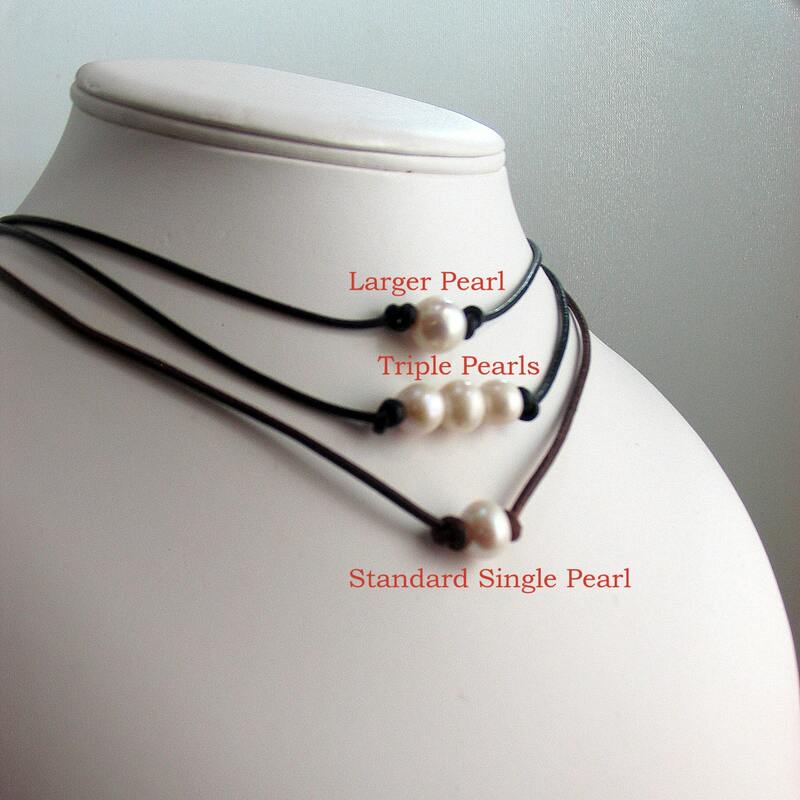 Robust 2 mm leather secures the 8 to 9 mm pearl (or 3 pearls) with knots in the center front. 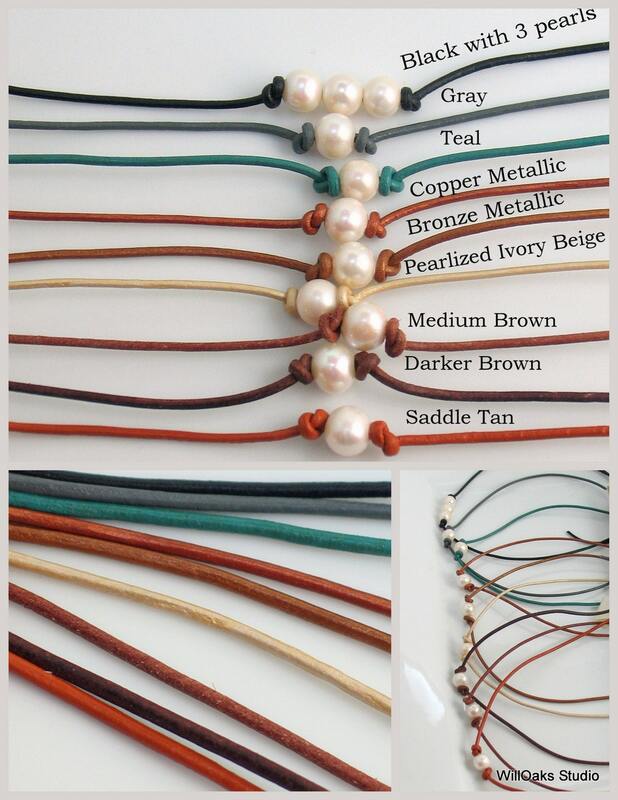 You'll choose the leather color and number of pearls-1 or 3-as you check out! 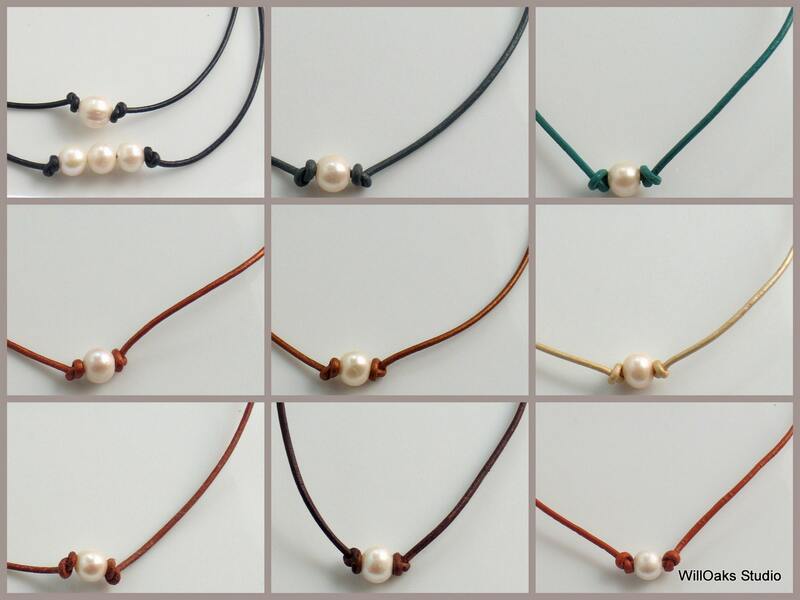 For a limited time, I can also offer a choice of a single, larger 10 to 11 mm pearl. Note your preferred length, if not 17", in "Notes to Seller." So easy to wear and you can wet the leather to get it to conform to your neck so it fits like a glove. 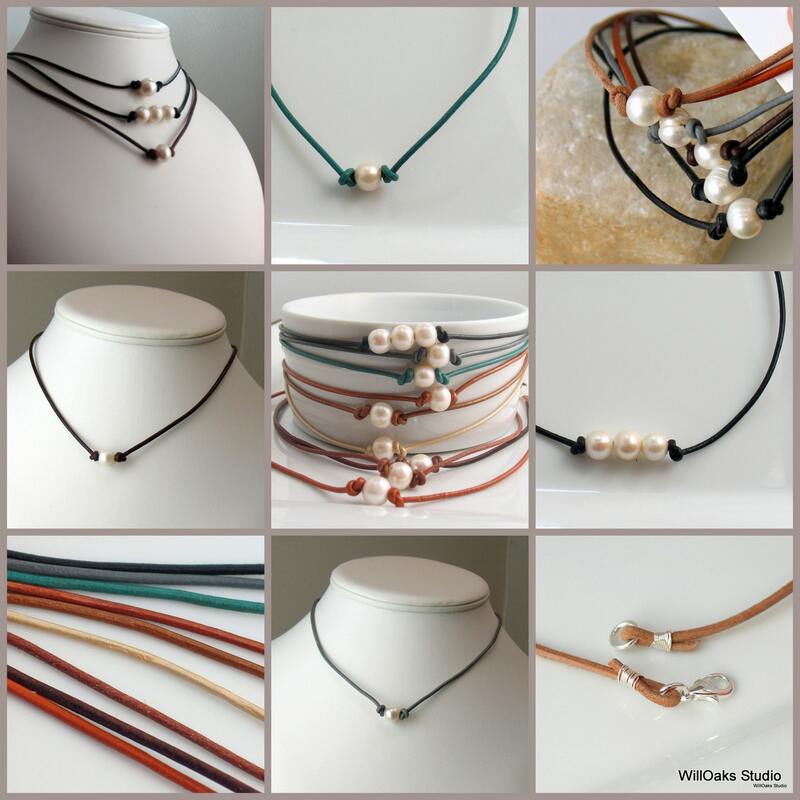 Since EACH necklace is MADE TO ORDER, you can request a custom size using "notes to seller" at check out for any total finished length from 13" to 20". Clasp and ring are tightly bound to the leather ends with sterling silver wire. Comes to you coiled into a small velvet pouch, mailed in a bubble lined envelope. And many of my newest additions to my "Pearls and Leather" in chokers & earrings feature gorgeous Druzy Pearls! Leather colors include your choice of black, gray, teal, copper metallic, bronze metallic, pearlized ivory beige, medium brown, darker brown, and saddle tan. 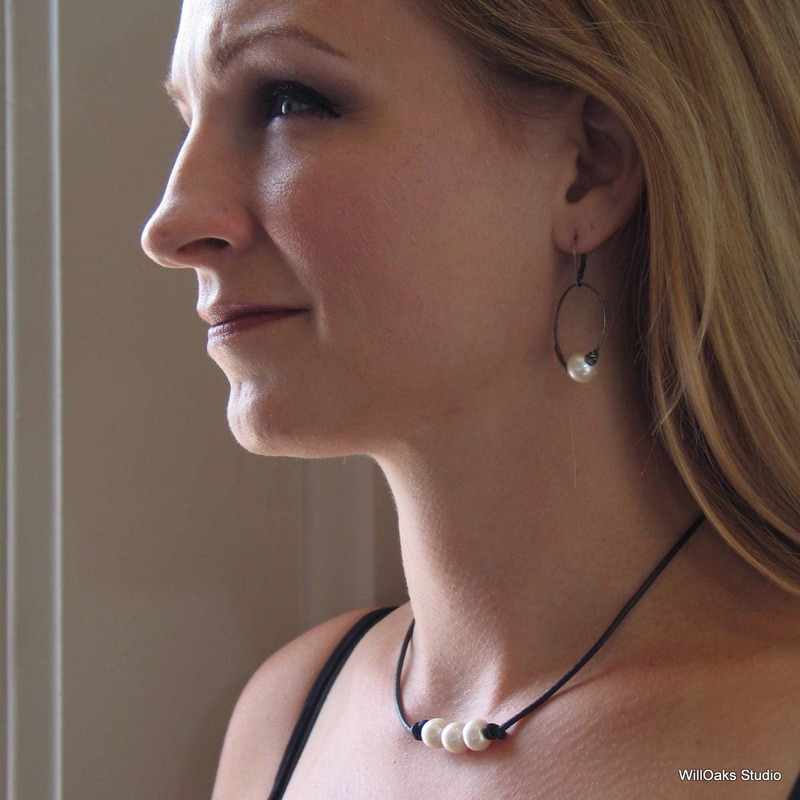 All pearls are natural, freshwater pearls so can be subtly variable. The item is great and as described. The shipping was late. Seller sent note, saying she was to busy with other things to send order by date promised. This was very disappointing because it was a gift. Seller then noted it went out even later then second promise date. While I appreciate her offering a partial refund, it didn’t leave me with a lot of confidence to use seller again. Samantha loves her choker! Good quality and craftsmanship.